Select the worksheet or worksheets for which you want to change the orientation. On the Page Layout tab, in the Page Setup group, click Orientation, and then click Portrait or Landscape. If you don't have a printer set up, the Orientation option will appear dimmed, and you won't be able to select it. To resolve this, you must set up a printer. The option also appears dimmed when you're editing the contents of a cell. To resolve this, press Enter to accept the changes or Esc to cancel the changes. Because you can set page orientation on a worksheet-by-worksheet basis, you might print some worksheets in a workbook in one orientation (such as portrait orientation) and other worksheets in the same workbook in the opposite orientation (such as landscape orientation). Simply set the orientation for each worksheet as appropriate, and then Print a worksheet or workbook. Select the worksheet, worksheets, or worksheet data that you want to print. In the Page Orientation drop-down box, under Settings, click Portrait Orientation or Landscape Orientation. When you are ready to print, click Print. To save time, you can save a workbook configured to print in landscape orientation as a template. You can then use this template to create other workbooks. Right-click a sheet tab, and then click Select All Sheets. Note: When multiple worksheets are selected, [Group] appears in the title bar at the top of the worksheet. To cancel a selection of multiple worksheets in a workbook, click any unselected worksheet. If no unselected sheet is visible, right-click the tab of a selected sheet, and then click Ungroup Sheets. 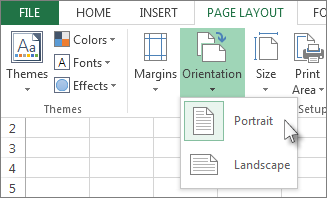 On the Page Layout tab, in the Page Setup group, click Orientation, and then click Landscape. Note: If you don't have a printer set up, the Orientation option will appear dimmed, and you won't be able to select it. To resolve this, you must set up a printer. The option also appears dimmed when you're editing the contents of a cell. To resolve this, press Enter to accept the changes or Esc to cancel the changes. Make any other customizations as necessary. Tip: If you want to customize several worksheets at one time, you can temporarily group the worksheets, make your changes, and then ungroup them. To group the worksheets, right-click any tab at the bottom of the worksheet. On the shortcut menu, click Select All Sheets. In the title bar, you should see the name of the workbook followed by the word [Group]. Then, change the orientation to landscape or make any other customization that you want. To turn off the grouping, right-click any tab, and then click Ungroup Sheets (or just click another worksheet tab). Click Save As, then select the location where you want to save your worksheet. For example, click Computer (or This PC in Excel 2016), and then click Desktop. In the File name box, type the name that you want to use for the template. In the Save as type box, click Excel Template (*.xltx), or click Excel Macro-Enabled Template (*.xltm) if the workbook contains macros that you want to make available in the template. The template is automatically sent in the Templates folder. Click the icon or name of your saved template. Note: When multiple worksheets are selected, [Group] appears in the title bar at the top of the worksheet. To cancel a selection of multiple worksheets in a workbook, click any unselected worksheet. If no unselected sheet is visible, right-click the tab of a selected sheet, and then click Ungroup Sheets on the shortcut menu. Tip: To see the borders of printed pages more distinctly, you can work in Page Layout view (View tab, Workbook Views group). In the printer properties dialog box, in the Layout tab, under Orientation, click Portrait or Landscape, and click OK. Note: If you don't have a printer set up, the Orientation option will appear dimmed, and you won't be able to select it. To resolve this, you must set up a printer. The option also appears dimmed when you're in the process of editing the contents of a cell. To resolve this, press ENTER to accept the changes or ESC to cancel the changes. Tip: When multiple worksheets are selected, [Group] appears in the title bar at the top of the worksheet. To cancel a selection of multiple worksheets in a workbook, click any unselected worksheet. If no unselected sheet is visible, right-click the tab of a selected sheet, and then click Ungroup Sheets on the shortcut menu. Tip: If you want to customize a number of worksheets at once, you can temporarily group the worksheets, make your changes, and then ungroup them. To group the worksheets, right-click any tab at the bottom of the worksheet. On the shortcut menu, click Select All Sheets. In the title bar, you should see the name of the workbook followed by the word [Group]. Then, change the orientation to landscape or make any other customization that you want. To turn off the grouping, right-click any tab, and then click Ungroup Sheets (or just click another worksheet tab). Don't forget to ungroup the worksheets. When worksheets are grouped, whatever you do to one worksheet affects all other worksheets, which is probably not what you want. The template is automatically placed in the Templates folder. Tip: If you copy any Excel workbook into the Templates folder, you can use that workbook as a template without saving it in the template file format (.xltx or .xltm). In Windows Vista, the Templates folder is usually C:\Users\<your name>\AppData\Roaming\Microsoft\Templates. In Microsoft Windows XP, the Templates folder is usually C:\Documents and Settings\<your name>\Application Data\Microsoft\Templates. In the New dialog box, double-click the template that you just created.